sadness of the war and the white mean hope , peace and truth. lose someone of their family or friends. 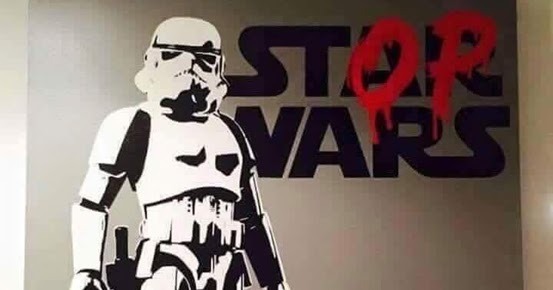 For Jimmy the stormtrooper lost someone he loved and wants to stop the war. and A P to make Stop. For Victor , it’s a very simple but amazing work of art because a little change can modify everything . It’s a tag painted by Banksy in 2015 on a bridge of the Nord-Pas-de-Calais , it’s in the north of the France. The technique which is used is the spray can. 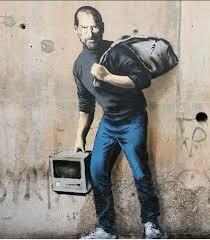 The painting represent Steve Jobs with a ancient modele of Apple computer in his right hand and there is a bundle in his left hand. The message which is conveyed is to illustrate the crisis of migrants by reminding people that Steve Jobs was the son of a Syrian migrant. It’s well made but the message is a little bit sad because the theme of migrant isn’t very happy and it didn’t inspired me. 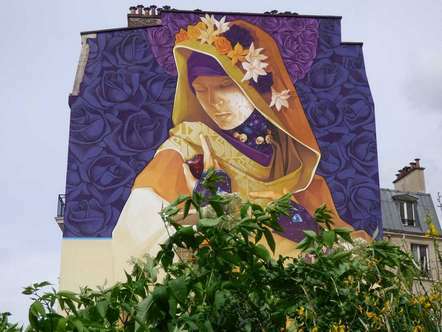 Dans le 13e arrondissement, il y a beaucoup d’œuvres de street art. Des galeries d’art payent des artistes pour venir et décorer les murs d’immeubles. En effet, ils proposent aux artistes de venir exposer leurs œuvres dans la galerie et leur permettre de peindre des fresques géantes sur les murs du 13e arrondissement. Mais ils ne travaillent pas gratuitement, la galerie paye environ 2000€ pour chaque œuvre réalisée dans la rue, mais aussi prend en charge les frais de voyage, l’hôtel et tout le matériel nécéssaire. Mais tout cela coûte cher, et pour les aider, de nombreuses entreprises françaises (Leroy Merlin, RATP, Acorus…) s’associent et aident financièrement (aussi en matériel, comme la peinture à Leroy Merlin) la galerie. De nombreux artistes sont déjà venus du monde entier, (polonais, américains, japonais, français, chiliens, espagnols…) dont le célèbre OBEY, qui est venu peindre 3 fresques depuis 2008, dont la dernière a mis 15 jours à être réalisée avec 5 associés (=assistants) dans le 13e arrondissement tout en exposant ses œuvres dans la galerie. It’s a tag. 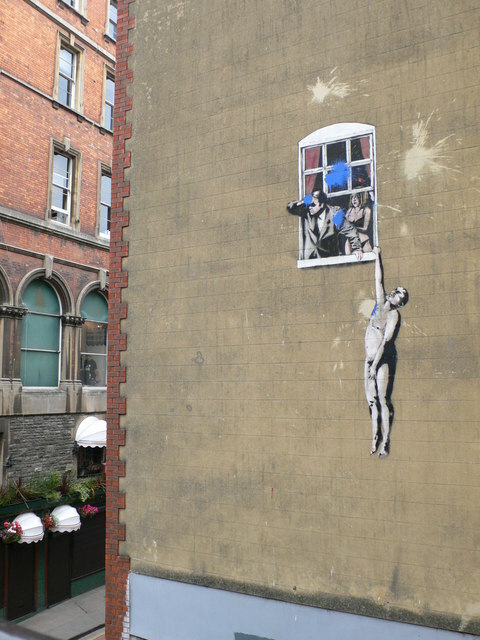 It was painted by Banksy in 2006, in Bristol on Park Street. 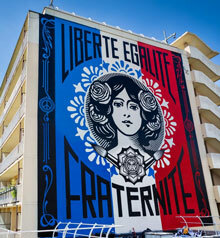 The technique which is used is stencil and paint. The title is “Naked man hanging from a widow”. On this work of art I can see a suited man, a woman with underwear and a naked man hanging from a widow sill. The painting represents a woman who’s cheating on her husband with someone else ( the naked man). The suited man is looking on the right and the naked man is on the left, the woman is trying to calm down her husband who’s trying to find the lover. The work of art is dull because there is not a lot of color. The message which is conveyed is not to cheat on your partner or you’ll be like the naked man. Maybe the artist wants to criticize people who have cheated on their partner and also he’s trying to deter someone from cheating on their partner. This work of art is funny and well made because it can happen in real life. Cette œuvre est l’une des plus connu par Bansky. L’œuvre est faite par un pochoir, graphitti, bombe de peinture. Le bouquet de fleur représente la protestation et la manifestation. Bansky en tant que révolutionnaire a fait cette œuvre pour le conflit israélo-palestinien qui a débute en 14 mai 1948 .